The following are my opening remarks about the value of literature, from a recent panel discussion of the VanDamme Academy curriculum. I am going to begin my discussion of the VanDamme Academy literature curriculum by sharing a story from this school year. One of my favorite days of every year in 7th grade literature is the day I teach the “mob” scene in To Kill a Mockingbird. In this scene, a mob has gathered outside the jailhouse, ready to take the law into their own hands and lynch the man being held there. 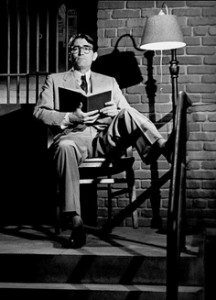 And all that stands in their way is Atticus, the man’s feeble, old lawyer, who knows they are coming, and will do the little that is in his power to stop them. Meanwhile, Atticus’s children, Jem and Scout, fearful of what might be bringing their father away in the middle of the night, have followed him to the jail, and come upon this scene. When they feel Atticus is threatened, the children run to his side. Standing beside him, young Scout looks out into the mob and sees a man she recognizes, a man who is the father of her classmate, a man who once owed Atticus money he didn’t have and was allowed to pay the debt off slowly, in the form of goods. Scout says, with guileless kindness, “Hey, Mr. Cunningham.” And essentially with nothing more than that, the mob is dissolved, and they leave. I came into class the next day and asked what had happened. I asked why the simple, seemingly irrelevant words of a child had the power to break down a mob of men. Some had a sense of it, and couldn’t put it into words. Others had absolutely no idea. That led to a discussion of the mob mentality – of having courage under the cover of darkness; of being emboldened by the anonymity of dissolving in a crowd; of daring to do with the support of a group what you wouldn’t do on your own; of acting impulsively, on emotion, without pausing for reflection and rational consideration. We discussed the effect Scout’s innocent words had on the mob. That they singled out one man, shining a spotlight on him that forced him into individual accountability for his actions; that they humanized Atticus who, in the mob’s rage-driven stupor, had become only an obstacle in their path; that they reminded them he was a man, a man who had shown them kindness, and a man who had children, just like they did. As I tell this story, I can picture my students’ eyes, and it is the most beautiful sight I know. They were riveted. The scene itself had become sparklingly clear, and that is deeply satisfying. But more than that, they had gained knowledge that was potent. They had come to understand an important aspect of human nature. They had learned principles that would shed light on times they themselves had felt the victims of a mob, or been witness to a mob, or inevitably been members of a mob – because though they haven’t ever staged a lynching, they have all at some point had a mob mentality. The essence of adolescence is defining yourself in relation to the group. This scene is so powerful, and so memorable, and so instructive – and it constituted just one day in their many years of discussion of great literature. I could tell many other stories. I could tell you about the time a student declared that I had “ruined her for romance” because she would never, ever find a man as wonderful as…Cyrano de Bergerac. I could tell you about the two or three students who, four days into this school year, were wiping away tears as we discussed the feeling of an acute memory of loss in Wordsworth’s poem “Surprised by Joy.” I could tell you about the student who swore she would make all her younger sisters read Ibsen’s “A Doll’s House” because she believed its theme as relevant to women today as it was to those in 19th century Europe. And I could tell you about my class today, when I finished reading aloud the final chapter of To Kill a Mockingbird, and the class erupted in applause. The common denominator of these stories is this: the fundamental goal of the literature program is to endow the students with this sort of passion, and this sort of wisdom. If I had more time, I would describe what the goal of the curriculum is not. It isnot fundamentally to make the students “well-read” in the sense that they have accumulated an impressive repertoire of works. It is not to teach them how to be literary excavators, digging up similes and metaphors and examples of onomatopoeia. It is not to expand their vocabulary so they score well on the SAT’s. It is to mine the sort of potent knowledge they gained in our discussion of the mob scene from the many timeless works of quality literature available to them. It is to help shape them as human beings – to expose them to psychological truths, to models of virtue and vice, to archetypal life challenges, to grand-scale ideas – and thereby to help them become more thoughtful, observant, wise, and deeply value-oriented human beings. To make life “bigger, sweeter, more tragic, more intense, and more alive with meaning” is the goal of the VanDamme Academy literature curriculum. Previous Previous post: Do Standards Work?